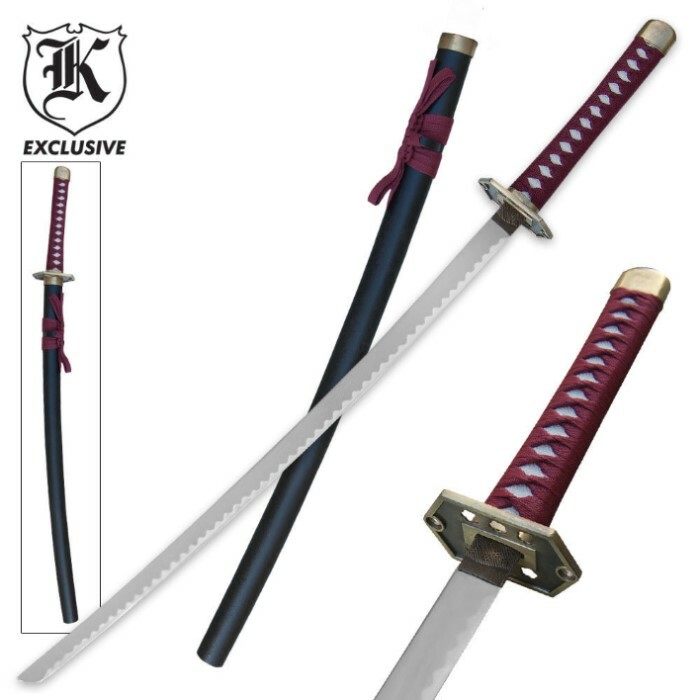 Crimson Diamond Samurai Katana Sword | BUDK.com - Knives & Swords At The Lowest Prices! This beautiful Crimson Diamond katana combines the trademark characteristics of the katana's artistic craftsmanship and legendary weaponry! Measuring 37" overall, this outstanding sword features a 26" AUS-6 stainless steel blade. The traditional handle is wrapped in deep crimson nylon cord with ornamental pommel and tsuba. I alrady have two renaissance knight swords, and this is my first oriental style sword. I have to say at first inspection, Everything seems great. I looked it over good for any scratches, rust marks, or fraying, and didn't find any. I gave the sword a few quick shakes to check for wobbliness, and there wasn't any. I shook it up and down, side to side, and in a figure eight motion. no wobble or anything to cause me any concern.